The immigrant workforce is characterized by its relative youth and its low levels of education. Most foreign-born workers fall between the ages of 25 and 44 and a smaller share has a college education compared to the native born. Does it follow, then, that the concentration of such workers would have a more pronounced effect on the employment rate of native-born workers who also have low levels of education and are of similar age? As was the case for all workers, there was no relationship between the inflow of foreign-born workers with less education and relative youth and the employment outcome of native-born workers with less education and similar ages. The foreign-born population with less than a high school education grew very rapidly between 1990 and 2000. The largest increase—583%—was in North Carolina. Other states that witnessed large increases include Georgia (420%), Arkansas (341%) and Utah (268%). The simple average of the increase in the population of foreign workers across all states and the District of Columbia who had less than a high school education was 114%. Of foreign-born workers with at least a high school education, states with the largest increases were North Carolina at 232%, Georgia (198%) and Nevada (189%). The average increase was 81%. Figures 5 and 6 chart the changes in the foreign-born population between 1990 and 2000 and the employment rates for native-born workers in 2000 for those with less than a high school education and those with a high school degree (see Figures A5 and A6 in Appendix A for the analysis of 2000-2004 data and Tables A3 to A6 for data on all states). The four quadrants in Figures 5 and 6 have the same meaning as in the preceding analyses. The rapid growth in the less educated foreign-born population does not appear to have harmed the employment prospects of less educated native-born workers. Following the same line of reasoning as in the earlier analyses, it is clear from Figures 5 and 6 that there was no apparent relationship between the growth of foreign workers with less education and the employment outcome of native workers with the same low level of education. For example, the population of foreign-born workers with less than a high school education increased 583% in North Carolina between 1990 and 2000 (Figure 5). However, the employment rate for comparable native-born workers in North Carolina was 39.4% in 2000, higher than the across-state average of 38.5%. Georgia and Utah are examples of two other states, among a total of 15, where above-average increases in the least-educated foreign-born population were associated with above-average employment rates for native-born workers (FB +, NB +). In those 15 states there appears to have been no negative impact from the rapid influx of foreign-born workers without a high school education. The growth in the foreign-born population with less than a high school education was also above average in five other states. But in those states, employment rates for native-born workers proved to be worse than average, indicating possible harm from the inflow of less educated foreign-born workers (FB +, NB ─). Those states include Alabama and Arkansas. The growth in the foreign-born population with less than a high school education was below average in 30 other states and the District of Columbia (Figure 5). In 14 of these states, employment rates for native-born workers proved to be higher than average, indicating that the native born may have benefited from the relatively slow growth in the less educated foreign-born population (FB ─, NB +). These states included New Hampshire, Vermont, South Dakota and Texas. Most areas—16 states and the District—witnessed both below-average employment rates for native-born workers and below-average growth in the foreign-born population with less than a high school education (FB ─, NB ─). This too shows that there may not have been a negative impact from the inflow of less educated immigrants. Those states include West Virginia, New Jersey, New York, Illinois and California as well as the District of Columbia. 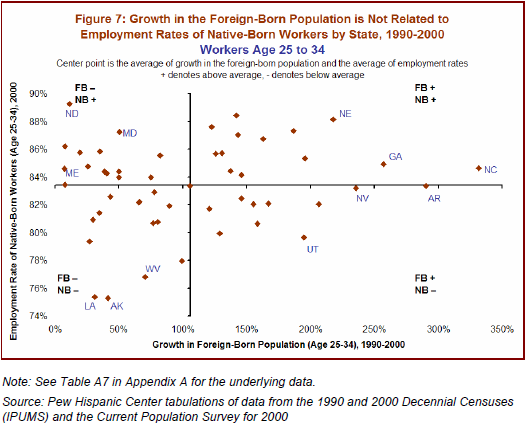 Figure 6 confirms the lack of an association between the growth in the foreign-born population and the employment rates for native-born workers with a high school education. The 50 states and the District of Columbia are scattered across the four quadrants indicating that employment prospects for native-born high school graduates may not have been directly affected by the growth in the foreign-born workforce with a high school diploma. The same conclusions emerge for the 2000-2004 time period (see Figures A5 and A6 in Appendix A). Like education, age is not a factor when considering how the inflow of foreignborn workers has affected native-born workers. In Figures 7 and 8, the analysis is extended to two groups: those between 25 and 34 and those between 35 and 44 (see Figures A7 and A8 in Appendix A for the analysis of 2000-2004 data and Tables A7 to A10 for data on all states), Once again, there is no relationship between growth in the foreign-born population in those age groups and the employment rate of native-born workers in the same age groups. The average growth in the foreign-born population of ages 25 to 34 was 106% between 1990 and 2000. 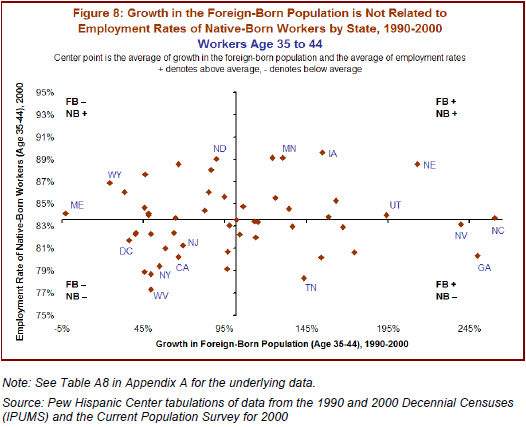 There were 23 states in which the growth of the foreignborn population exceeded the average. Among these states, 13 had above-average employment rates for native-born workers of ages 25-34 (FB +, NB +). That group includes Georgia, North Carolina and Nebraska (Figure 7). In 10 other states, including Arkansas, Utah and Nevada, above-average growth in the foreign-born population ages 25-34 was associated with below-average employment rates for native workers (FB +, NB ─). The rapid growth of foreignborn workers did not have a consistent impact on native-born workers who were of the same age. In 27 states and in the District of Columbia, the growth in the foreign-born population of ages 25-34 was below average. Those areas were equally divided with respect to the outcomes for native-born workers, again indicating a lack of association between immigration and employment outcomes for native-born workers (Figure 7). In 13 states and the District of Columbia, employment rates for native-born workers ages 25-34 were above average (FB ─, NB +). That was the case in North Dakota, Maine, Maryland, New Jersey, Illinois and Florida, among others. However, in 14 other states employment rates for native-born workers of the same age were below average (FB ─, NB ─). This group includes West Virginia, Alaska, Louisiana, California, New York and Texas. In sum, even though the majority of foreign-born workers are relatively young, their entry was not directly related to the employment prospects of similarly aged native-born workers. What was true for ages 25-34 was also true for workers of ages 35-44 (Figure 8). The 2000-2004 time period had similar results (Figures A7 and A8 in Appendix A).